March, 2016 | H&R Group K.K. 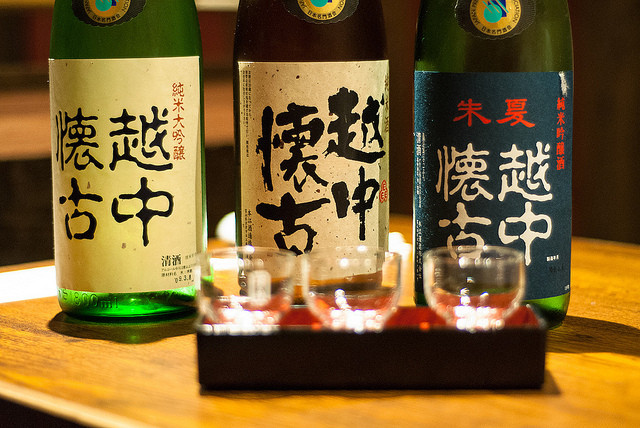 Sake, of course, is famous around the world for being Japan’s national drink. Though the drinking of Chinese alcohol is thought to predate recorded history, it is believed that sake as it is currently known – made up of rice, water and ‘kōji’ mold – dates from around the Nara period (710 to 794), and then later used for religious ceremonies court festivals as well as drinking games. Originally the production of sake (actually called ‘nihonshu’ in Japan, with ‘sake’ being a term to cover all alcoholic drinks) was the preserve of the government, but later it was made by temples and shrines. Nowadays there are many breweries, or ‘kura’ around the country (in 2007 there were approximately 1700 kura making around 10,000 different types of sake), so getting acquainted with it can be tough for the uninitiated. Thankfully, while the Nagoya area isn’t particularly famed for its sake production, you there are many places at which you can give it a taste. The below postings are all recommendations from sake lovers that I know and trust, so are about personal taste. As such everything sisfor information only and Japan Info Swap does not endorse any of them. This is the ideal place for those of you who know little about sake but want to expand your knowledge. In fact this recommendation came from a friend of mine who wanted to do just that and is now well on her way to becoming an expert. If you have sixty minutes and 2,000 JPY to spare, you can sample up to 40 different types of sake and learn exactly what your tastes and preferences are in this stylish bare concrete and chrome bar. Seeing as trying the lot would mean a different sake every one minute and thirty seconds, unless you are a particularly hardened drinker, you may want to go more than once! On the face of it, Japan has something of an odd relationship with pizza. You can find pizza slices in most bakeries, convenience stores do pizza dumplings called pizzaman and the range of pizza flavoured potato chips is mind boggling. It’s obvious that the Japanese love pizza, but none of these are what you would consider ‘proper’ pizza. I mean, just take a look at a Pizza Hut menu and you will find all sorts of strange toppings such as mayonnaise, seaweed, and mentaiko fish eggs. And that will be on just one pizza! Though Devilcraft is best known for its beer (and you can find it mentioned in our guide to Tokyo’s craft beer restaurants here), its pizza is frankly amazing. A deep dish, Chicago style pizza, this is a pie worth reckoning with. So good that a friend of mine, a native of the Windy City, travels from Nagoya to the Kanda branch twice a year simply to get this taste of home. Another American style pizzeria, this place is like a real slice of the city that never sleeps. And I mean slice, as just like in NYC, Rocco’s serves up the pizza by the slice. Run by an American, it has the New York style red and white checked table cloths and a counter-top display case with slices to choose from. Though not as big as you would expect to find Stateside (this is still Japan) they ooze with cheese and the meat lover’s is chock full of pepperoni, ham, and Italian sausage, guaranteed to fill you up. Though American style pizza is making inroads in Tokyo, there is no doubt that it is the Neapolitan style that is dominant in the city, and Pizzeria e Trattoria da Isa is perhaps the best of the lot. Shabby in traditional Italian style, this popular restaurant is the baby of award winning piazziolo Hisanori Yamamoto and is as popular with Italian ex-pats (amongst them Alberto Zaccheroni, the Italian one-time manager of the Japanese national soccer team) as it is with locals. You can expect long queues but also great, authentic pizza. If da Isa is considered amongst the best in the city, then Seirinkan can boast a link to the greatest longevity. Long before the pizza boom in Japan, Susumu Kakinuma spent a year travelling Italy, testing and tasting what he found, before bringing his discoveries back to Tokyo. He set up the Savoy chain of restaurants and in 2007 opened Seirinkan. This steampunk style restaurant themed on Jules Verne’s novel 20,000 Leagues Under the Sea takes delicious simplicity to the maximum. Though the pizzas spend just 60 seconds in the oven, the crust is slightly charred and salty, and the sauces are minimalist with sprinklings of ripe tomatoes and basil as well as lashings of the finest olive oil. If you are looking for something a touch on the upmarket side with a full dining experience you can head over to Napule in Minato-ku. With plenty of Italian style deco and even a guitarist serenading the diners, it offers a real touch of (if slightly stereotyped) Naples. With World Pizza Championship-winning chefs manning the ovens you can be assured that you are going to be getting great, authentic food, and the service is top notch (decanted wine is warmed by candle to ensure the full release of odour). It can be a little pricey – pizza, drinks, coffee and desert can easily surpass 6,500 JPY per head, but it’s certainly cheaper than flying to Italy. *Please note, the above is for information only. Japan Info Swap does not endorse any of the aforementioned restaurants. J League Soccer is Back! While sumo and baseball are the undoubted kings of Japanese sport, there is mounting evidence to say that, amongst the younger generations, soccer (サッカー) is fast becoming a force to be reckoned with. With the international women’s teams winning the World cup in 2011 and finishing runners up in 2015, and players such as Shinji Kagawa, Shinji Okazaki and Keisuke Honda becoming household names in the big European Leagues, the sport has increased in recent years, not only in international exploit, but also in the domestic league, the J League. Perhaps to get a bit of a head start on baseball, the soccer season is all ready under way, and it’s shaping up to be a pretty exciting year. Soccer, or Association Football, has a long history in Japan spanning back some 145 years. It is disputed as to whether it was begun by British ex-pats in Kobe or Royal Navy officers in Yokohama, but the first team to be founded was Tokyo Shukyu-dan in 1917, an amateur group that still plies its trade in the fifth level of the Japanese football system. Four years after that first club came the first cup competition, the Emperor’s Cup. It was competed by just four teams, but it is now competed by all teams around the country, including those of universities and schools. Aside from the cup competition, there were various attempts at creating a national league, but it wasn’t until 1965, spearheaded by a German, Otto Cramer (who would go on to guide the Japanese men’s team to a remarkable third place in the 1968 Mexico Olympics) that the Japan Soccer League was established. At this time most competition took place between university teams and corporation teams, but it was the latter that would go on to take advantage of the new league. Initially these company teams were formed to encourage a cross-company unity between coworkers as well as creating brand awareness, but soon company employees were eschewed for professional soccer players given defacto positions of employment so as to qualify. Though the league started as only eight teams, a second division was created with promotion and relegation possible in 1972. Despite this growth fans were reluctant to be drawn to ramshackle stadiums, and the league dwindled, not truly coming into life until the introduction of the J League. The brainchild and driving force of the J League was undoubtably Saburo Kawabuchi. As a one time National team manager, Kawabuchi held a long term dream of seeing a fully-professional domestic league with which to improve the national side (the JSL and its previous incarnations were amateur). This came to fruition in the guise of The J League in 1993. Eight teams were chosen from JSL first division, one from the second and a newly promoted team to compete in the new league, and officially kicked-off on May 15, 1993 as Verdy Kawasaki hosted Yokohama Marinos at the Kasumigaoka National Stadium with Yokohama coming back from a goal down to win 2-1. Initially the J League was a massive success, with superstars from the international footballing community joining the Japanese clubs including Gary Lineker at Nagoya Grampus and one of the world’s greatest ever players, Zico, joining Kashima Antlers. Unfortunately this boom was short-lived and attendances fell into decline. However following a restructuring of the league to create a second decision (J2) and renewed enthusiasm due to the national team qualifying for the France ’98 World Cup, the league once again grew in stature, something recognised by Japan playing joint hosts alongside South Korea for the 2002 World Cup. Since then the Japanese league has risen to become a powerhouse in Asian football. Its teams regularly win the Asian Federation Confederation Champions League, and it is also the only Asian League to receive a top class ‘A’ ranking by the AFC. There is a good chance that you don’t know much about the various teams that compete in the J-League, so here as a brief introduction to some of the biggest movers and shakers. What you need to know: Despite having not expected to be part of the new J League, Kashima have proved by far Japan’s most successful club team,in the modern era having won the title a record seven times, the J. League Cup a record six times and the Emperor’s Cup four times for an unrivaled total of seventeen major domestic titles. What you need to know: One of only three teams to have remained in the J-League 1 since its inception, Grampus have been home to footballing legends like Gary Lineker, Arsene Wenger and most recently Dragan Stojkovic, the latter bringing them their most recent silverware in 2011. What you need to know: In one of their earlier incarnations, Sanfrecce were the inaugural winners of the JSL in 1965, also completing the first double by taking theEmperor’s Cup and going the entire season undefeated. In recent years they have become a league powerhouse, winning the J-1 League in 2008, 2012, 2013 and are current champions. What you need to know: In 1978 they were the first Japanese club to complete a domestic treble, when they won the title, the Emperor’s Cup and the Japan Soccer League Cup. Success had been sporadic since then, but in the 2000’s they won a spate of cups, including the AFC cup, and the J-League. In 2014 they faced international notoriety when their fans unfurled a banner reading Japanese Only. What you need to know: Gamba Osaka is currently the second-most successful J. League club, having won eight domestic titles as well as the 2008 AFC Champion’s League, and the treble in 2014. By far their most pouler player is Yasuhito Endo who has 152 caps for the Japanese national team. Just 50 km southwest of Tokyo city center there lies an exquisite island of such natural beauty you wouldn’t be surprised to find it inhabited by celestial beings. So be not surprised, because that is precisely what you will find. The island of Enoshima is the jewel in the crown in the coastal region of Shōnan in Sagami bay and has long been so, having drawn visitors to its splendor for more than 1,000 years. Given its locality to Tokyo, that is not about to change any time soon. According to the Enoshima Engi, a two part history of Enoshima written by the Japanese Buddhist monk Kōkei in 1047 AD, villagers in the Enoshima area were plagued by a five headed dragon called Gozuryu for 1,000 years. Then, in 552AD Benzaiten, the Shinto goddess of music and entertainment, rose the island from the waterbed to act as her home. With a celestial display of her magnificent powers, she entranced the dragon who fell in love with her. The dragon of course professed his feelings, but Benzaiten spurned his advances, and in doing so made the dragon realise his shame for treating the people so badly. Vowing to leave the people in peace, he turned to face the island home of his beloved, and remaining motionless through time transformed into a hill that remains to this day Tatsu-no-kuchi yama, Dragon’s Mouth Hill. Since then the goddess Benzaiten is enshrined upon this island making Enoshima – along with Chikubu Island in Lake Biwa and Itsukushima Island in Seto Inland Sea – one of the Three Great Benzaiten Shrines. As well as religious treatise, Enoshima also features in one of Japan’s most famous works of art. The island and the inhabitants who lived there is number 17 in the yukio-e series ‘Thirty-Six views of Mount Fuji’ by Katsushika Hokusai (1760–1849). But the island is not just a place that is enraptured with the past, it is also a thriving hub of tourist activity today. Other than its beautiful surrounding beaches which arre a draw for both Tokyo families and youth alike in the summer months, the biggest draw to Enoshima is the aforementioned Enoshima Jinja, shrine of Benzaiten. This shrine features the goddess in a state of undress (also known as ‘Hadaka Benten’) which is an unusual state in which to find her. There are also many other shrines and temples around the island, including one specifically for couples featuring a lovers bell. The beautiful island also features the Samuel Cocking Garden, botanical gardens named after a British merchant (who amongst other things is credited with introducing the lightbulb and the bicycle to Japan) who in the 1880s owned the highlands of the island and set up an extensive greenhouse of tropical plants. The original was destroyed in the great Kanto earthquake of 1923, but the foundations were rediscovered in 2002 and have since been restored, seeing over 500,000 visitors a year. Another draw to the city is the Enoshima Aquarium, which though not on the island itself, is hugely popular. It features amongst other things, dolphin shows, killer whale shows and all sorts of marine life. Towards the end of the summer it is open in the evening for the night aquarium experience, after which you can visit one of the many delightful restaurants along the sea front. But be warned, both the aquarium and the restaurants can become extremely busy in summer. These sights aside, perhaps one of the best things about Enoshima is the joy of wandering the 4km island, starting on the foot bridge that connects the island with the mainland and overlooks the beaches of frolicking families, surfers and jet-skiers, the island is a warren of criss-crossing streets and alleyways. On nice days you can follow them all around the island, past the temples, through the botanical gardens, via cafes and shops and over to the other side to the ancient caves and crab pools. As the island is quite hilly, walking around, particularly in the hot summer months, can be a challenge, but on the clear days when you can see across the water to mount Fuji as depicted by Hokusai (best viewed on clear winter days), it is very much worth the energy. See this related article on Enoshima Spaland! The undoubted food of choice in Enoshima and the surrounding areas is the Shirasudon. This rice bowl, topped with thousands of whitebait fish called shirasu, is the area’s signature dish. There are many restaurants dedicated to it, most of which serve the shirasu boiled. However, the local delicacy is the raw shirasu (nama shirasu), and it is the restaurants serving it that prove to be most popular, with the longest queues outside. For those turned off by the thought of eating thousands of baby fish in one sitting, there is plenty of other seafood to choose from. Enoshima is served by three railway stations: Katase-Enoshima Terminus on the Odakyū Enoshima Line, Enoshima Station on the Enoshima Electric Railway (‘Enoden’), and Shonan-Enoshima Station on the Shonan Monorail. From Tokyo you can take the JR Odawara line to Fukisawa and take the Odakyū Enoshima Line to Enoshima. From there the island is a pleasant 1.7km walk. Pot Luck: Please bring some food to share with everyone. There are also food vendors in the park. Drinks: Please bring your own drinks. Directions: Exit Tsu station from the west exit, walk up the street to the first traffic light, turn left and proceed south, at the second traffic signal you will turn right and go up the stairs and enter the park. Location in the park: Once you reach the park look for the Canadian Flag. Make sure to pre-register on the TJCS Facebook page (click “Jojn”). It is always good to know who is coming! For members coming from Nagoya and other areas there will be a meeting time at Nagoya station posted on the TJCS webpage or this facebook event page. The Tokai Japan Canada Society (TJCS) was formally established in November, 2004 to promote the development of social, cultural and commercial relations between Canada and the Tokai region of Japan (Aichi, Gifu, Mie and Shizuoka Prefectures). The TJCS is a not for profit organization that creates opportunities for its members to develop greater social, cultural and commercial relation between Canadians and Japanese, as well as other foreign nationals living in the Tokai region. Hiroshima is a company town. Mazda is the region’s biggest employer and the car maker bankrolls the city’s professional baseball team, the Hiroshima Carp. The company was instrumental in rebuilding Hiroshima after the atomic bombing in 1945. Only days after the blast leveled the industrial base of the city, the Mazda assembly line was back up and running. Space was cleared in the company headquarters for the Hiroshima prefectural government. Japan tends to be parochial when it comes to its automobiles and it will not take long in Hiroshima to know you are in Mazda country. Car companies have historically taken the name of their founder – Louis Chevrolet, Ferdinand Porsche, Soichiro Honda, Charles Rolls and Henry Royce. Mazda, however, takes its name from the Persian god of light, intelligence and wisdom, Ahura Mazda. That is because the business began life as a cork company. Founder Jujiro Matsuda started his working life in 1889 as an apprentice to a blacksmith. In his thirties he invented an industrial pump and gained control of the foundry. During World War I his Matsuda Works churned out military supplies for Russia and manufactured the Type 99 rifle for the Japanese army. In 1921 Matsuda returned to his home town to take over the operations of a struggling artificial cork manufacturer named Toyo Kogyo. He was not able to revive the company and redirected its efforts into tools. In 1931 Toyo Kogyo introduced its first motor vehicle, a motorized tricycle with a small pick-up bed on the rear. The autorickshaw was called a Mazdago and was sold by Mitsubishi; it puttered around Japanese streets with a single cylinder, air-cooled engine that cranked out 13 horsepower. The company would not adopt the name Mazda until 1984. You will learn all this at the Mazda Museum, which is at the car manufacturer’s global Hiroshima headquarters. The museum is actually deep in the bowels of the enormous Mazda factory. Unlike most of Japan’s car company museums, you cannot just walk in off the street like at a traditional showroom and kick the tires – a tour must be arranged ahead of time. But it is free, easy to arrange and available in Japanese or English. The tour starts with a short bus ride from the corporate office to the waterfront manufacturing facility. Inside the gleaming entrance hall are the latest models and award-winning Mazdas of the past. Upstairs in the history room are an array of Mazdagos arranged in front of a circular timeline depicting the Mazda models of yesteryear. On the floor are such curiosities as Mazda’s first passenger car, the 1960 R360 Coupe, and the award-winning Familia from the same era that boasted an all-aluminum four cylinder engine. This vehicle marked the company’s transition from microcars to family sedans. An entire section of the museum is devoted to the rotary engine, the pride and joy of Mazda in the automotive world. The technology room takes the visitor through the entire automobile production process from first design to final assembly. The tour winds down with a trip to an observation deck overlooking the actual assembly line. Before you leave, you can check out prototypes for the future and browse the gift shop for Mazda memorabilia and swag from the Hiroshima Carp. Nishiyama Onsen Keiunkan: How Many People Have Signed the Guest Register of this 1,300 Year Old Hotel? Just doing the math is mind-boggling. A family business for over 1,300 years. Yes, there have been some heirs adopted in, but that is still 52 generations of the same family. And even more amazing, tourists to the Nishiyama Onsen Keiunkan in Yamanashi Prefecture today still enjoy much the same experience as the ancient samurai who visited the hotel back in 705 CE. The hotel is certified by the Guinness Book of World Records as “the world’s most historical inn” and it may well be the world’s oldest business, period. By comparison, Europe’s oldest hotel, Zum Roten Baeren, is a mere child – the Freiburg, Germany hostelry will celebrate its 900th birthday in 2020. Old inns are sort of a Japanese thing as the second, third and fourth oldest hotels in the world are all in operation here (number two, the Hoshi Ryokan, is only 13 years younger than the Nishiyama Onsen Keiunkan). The idea for the inn was originally Fujiwara Mahito’s. He was a son of an aid to Tenji, the 38th and then-reigning emperor, of Japan. Fujiwara built a small guest house near a hot spring (“onsen”) at a secluded spot in the mountains of the Kai region that is sometimes known as the South Japanese Alps. In addition to promoting the healing waters to the local townsfolk, Fujiwara encouraged weary military commanders to come and take the waters as well. Since this was the second year of the brief Keiun era before the ascension of the Empress Gemmei, the inn was dubbed Keiunkan. How did the Nishiyama Onsen Keiunkan survive for over a millennium? Through the years, centuries in fact, the Nishiyama has focused on service and doing what the inn does best – providing hospitality that flows like the spring waters with the spirit of Japanese harmony. The spa still sports only 37 rooms, each outfitted with a traditional tatami-mat floor, and 52 generations of operators have taken care to make only modest expansions to keep up with the demands of modernity. Of course the guest rooms all have baths and showers sourced with free-flowing spring water. Nishiyama Onsen Keiunkan is truly a space where time is measured in epochs and not years. All that time the one constant has been the natural hot springs. The same low-alkaline, 126-degree water gushes from the earth now as then. In fact the hotel, last renovated in 1997, has dug an 888-meter well that taps 1,630 litres of soothing water per minute. The Keiunkan provides four open-air baths that melt into the serene mountain scenery and two indoor baths. Guests enjoy a Mountain Kaiseki Banquet with in-season delights harvested from the mountains and rivers in season. Chefs prepare the highest quality A5-rank Koshu beef to a soft texture and elegant color. Meals are served to diners on the hotel’s prized dinnerware. Mt. Fuji and the treasured Jigokudani Monkey Park are nearby – the monkeys enjoy a dip in the local hot springs as much as their human counterparts. Packages are available between $500 and $600 per night; details can be found at the Nishiyama Onsen Keiunkan website. Stretching across the coastline of the Seto Inland Sea, Akashi, located in southern Hyogo Prefecture is a small port city packed full of gorgeous seaside views, a mild climate, and all of the fresh seafood you could want. There’s really nothing quite like enjoying the catch of the day while sitting on Okura beach and staring out at the Akashi-Kaikyo Bridge over the sea. Though many cities throughout Japan feature incredible seafood dishes, Akashi offers some unforgettable options that are unique to the city and shouldn’t be missed. A majority of the fishing done on the coast is for octopus and sea bream, so any dish including either fish is sure to be amazing. One such dish is Akashi’s version of takoyaki, ‘Akashiyaki’. These battered octopus dumplings are a bit softer and more egg-like than the nation’s more standard dough versions, but just as octopus-filled and delicious! Stands selling the treat can be found just about everywhere in the city, making the dish impossible not to try. Another local favorite, Ikanago no kugini, is available in the springtime and widely popular. Ikanago are small fish, and for the dish they are simmered in a blend of soy sauce, mirin, ginger, etc. until they turn brown. Actually, ‘kugini’ translated means ‘simmered nails,’ in reference to how the fish resemble rusted nails after being cooked. Despite the misleading name, these little fish are quite tasty and can be purchased in many places throughout the city. Some other seafood dishes you must try in Akashi include their tasty dried laver seaweed, Akashi nori, roasted or grilled sea eels, and their dried octopus. While all of the seafood restaurants around will serve delicious meals, the best place to try everything is the Uonotana Fish Market. Smaller than some of the big city markets in Japan, this fish-lover’s paradise makes up for its size in quantity and quality of seafood. Around 100 stalls line the shopping street, selling whatever was caught most recently. You can find a good price for a large amount of fish, or simply peruse the shops and sample the many flavorful varieties of seafood dishes. Putting aside various political differences, the Japanese people of late have been besotted by Korean pop culture. This includes Korean television drama programs that draw large Japanese audiences and the infectious popularity of young Korean music stars, K-pop. This ultimately infused vitality into Japan’s two most prominent Korea Towns: Shin-Okubo in Tokyo and Osaka’s Tsuruhashi. Koreans have long congregated to the Tsuruhashi section of Osaka making it Japan’s largest Korea Town. There are some 90,000 residents here, about a quarter of whom are emigrants from both North and South Korea. The community also harbors Korean nationals that emigrated from a once-unified country that no longer exists. These folks are given the choice of claiming South Korean citizenship or Japanese citizenship. Regardless of their origin story, most business in Tsuruhashi, while decidedly Korean, is carried on in Japanese. What you can find in Tsuruhashi? Start with food and that means kimchi. The national dish of Korea, an amalgamation of pickled vegetables, is so important to Koreans that it comes up in international negotiations. The best kimchi in Osaka is in Tsuruhashi and varieties abound at the numerous market stalls and food shops. Once you have sampled Tsuruhashi kimchi, you are likely to forego the typical supermarket offerings in Japan. Between the cafes, stalls and street food vendors, there are more than 150 eateries to work your way through in Korea Town. An entire street has been given over to Korean grilled meat offerings known as yakiniku. These bite-sized pieces of BBQ use all sorts of cuts of meat. Pajeons, Korean pancakes stuffed with fresh vegetables, can work as a grab-and-go item or the foundation of a meal. Everything Korean is on sale from cosmetics to instant noodles to traditional Korean garb such as wedding gowns and colorful hanboks. And especially anything relating to the newest and hottest K-pop band. If a piece of merchandise can be adorned with a fresh-scrubbed face of a K-pop idol, you will find it in Tsuruhashi. While the shops close early as is the custom in Korea, life behind the traditional-style Korean gates never shuts down – Tsuruhashi hops 24 hours a day. Miyukimoriten Shrine, the official entrance of Korea Town, is a short walk from Tsuruhashi station on Osaka’s JR Loop Line. Matsumoto Castle, Kumamoto Castle and Himeji Castle are considered the Big Three of Japan’s castles. Of the exalted trio, Himeji Castle in Hyōgo Prefecture is the largest with 83 buildings in the defensive compound. Himeji is also the most visited castle complex in the country. Himeji , located in Hyogo Prefecture, was first deemed necessary by samurai Akamatsu Norimura who participated in the sacking of Kyoto in the 1330s. His fort was ripped down by his son Sadonori and rebuilt in 1346 which launched a series of tear-downs and new castles for the next several centuries. The current configuration dates to the early 1600s when Ikeda Terumasa, the Shogun of Western Japan, was given the castle as a battle reward. He installed three moats and added so much to the fort that it is said to have involved 25 million man-days of work. The efforts of 10,000 workers were required. Himeji passed into private hands at auction after the abolition of the feudal system in 1871. The selling price was all of 23 Japanese yen – the equivalent to a little more than two thousand American dollars. The buyer’s plan was to demolish the castle and commercially develop the land but the cost of bringing the massive complex down was so great the project was abandoned. The castle survived American bombing in World War II and the Great Hanshin earthquake a half-century later. In 1993 Himeji Castle was recognized as one of the first UNESCO World Heritage Sites of cultural significance listed in Japan. Five of the castle structures, including the keep in the most defensible area inside the innermost moat, have been preserved as National Treasures of Japan, noted particularly for their classic Japanese castle architecture. Himeji has been nicknamed the White Heron Castle (Shirasagi-jō ) for its startling white exterior and its form that suggests a large wading bird taking flight. Many people who have never been to Japan have seen Himeji Castle. When Sean Connery was working to fend off World War III in You Only Live Twice, the fight scene with Japanese ninja warriors was filmed in the castle complex. But others lucky enough to be in Hyōgo Prefecture can tour the castle in person. Himeji has just finished undergoing a restoration that cost 24 billion yen ($212 million). Restoration is a key word since most other Japanese castles are replica creations. Here, the fir and cypress infrastructure remains original. Tours lead through many of the 21 gates still remaining in the complex and visitors experience the myriad of spiraling passageways that were designed to allow intruders to be attacked from behind. Trick gates and blind corners were built into the castle that could be blocked in seconds, trapping unwitting attackers. Slits built into walls could accommodate archer’s arrows and hatches in the floor were installed to pour boiling water on enemy invaders. Alas, none of these ingenious defensive devices were ever needed. James Bond did the only fighting inside Himeji Castle. Himeji Castle is open daily, closing at 5:00 p.m. There are family friendly activities in addition to historical and cultural tours. For more information go to the website.